YURI ARTIBISE SAYS: CONNECTIVITY IS KEY — Why Save the Viaduct? To Keep Kids Safe. Last week, I introduced the notion of urban fabric. Urban fabric is not just the built form, however. It also reflects the delicate interweaving of social, economic and physical connections. New developments need to be looked at not as single entities, but as part of a block, a neighborhood, a city, a region. Design guidelines and zoning that respect historic context and pedestrian scale are essential to creating great buildings and enduring places. Moreover, since every project is part of the overall urban fabric, how projects connect to each other and to the city is a central tenet of urban design. Streets, public transit, bike-ways and connected green space tie the city together. They provide the framework for a vibrant city. 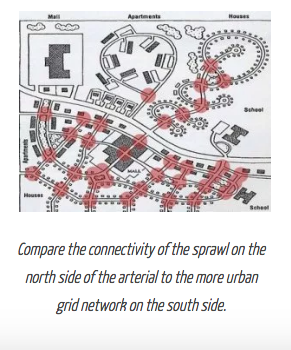 Compare the connectivity of the sprawl on the north side of the arterial to the more urban grid network on the south side. Creating more direct connections shortens travel time, which effectively brings people closer to their destinations. With more available connections, community residents can get to schools, shopping centers, and other spots that may have simply been off their radar before—not because these places were too far away—but because they were too far out of the way. Intuitively this makes sense; the smaller the blocks, the greater number of intersections, the more storefronts, the more choice of routes, the more chances for serendipity. All this leads to more urban vitality.